In January 1975, a local nightclub owner heard Robbie at an after-hours jam session, and hired him to lead a jazz band to entertain his customers. Robbie called five friends from the South Bay Traditional Jazz Society and organized the original Magnolia Jazz Band. The job lasted six weeks, every Friday and Saturday night. Through the mid '70s, we continued playing, often expanding to nine musicians, and performed at dances, parties, and concerts. I n the late '70s and early '80s, we specialized in the New Orleans revival style, popularized by the Bunk Johnson, George Lewis, and Preservation Hall Jazz Bands. The sextet made seven recordings, toured through the midwest and the east coast, and performed at many jazz festivals throughout the country. Now, in the 21st century, the band is going stronger than ever. 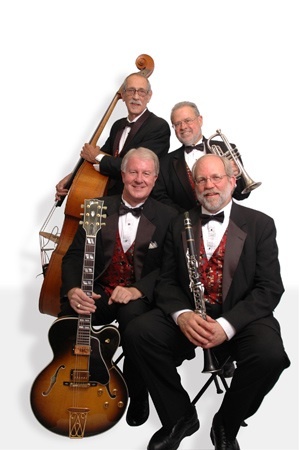 Since the late '70s, the trio (clarinet, guitar, and bass) has been working nearly every day. Our clients get swinging entertainment for corporate events, private parties, and wedding receptions at the best local hotels, restaurants, and nightclubs. The band knows how to be flexible -- often adding trumpet, saxophone, trombone, piano, drums, banjo, or tuba, to provide the right size combo for every occasion. Selecting music from a wide repertoire, we play the popular standards, Latin favorites, and hot jazz classics from the '20s, '30s, '40s and '50s. The Magnolia Jazz Band specializes in entertaining people. Because we help make each event successful, our clients keep calling us for more. Although most of our engagements are private parties, we regularly bring a swinging mood to public events throughout the San Francisco Bay Area.